I'm looking for insight from those who have gone before. I'm going to have Stein design, cut, dip, laser etch and make the wiring diagrams for my dual screen G3X centric panel. I was planning on making up my own harness with materials purchased from Stein. Those who have made their own harness, what are your thoughts- is that a good idea? I know it's time vs money. I need to cut back somewhere. It would probably take them 40 hours to make my harness, I'm guessing 200 hours for me. I rolled my own wiring harness. I didn't find it all that difficult. 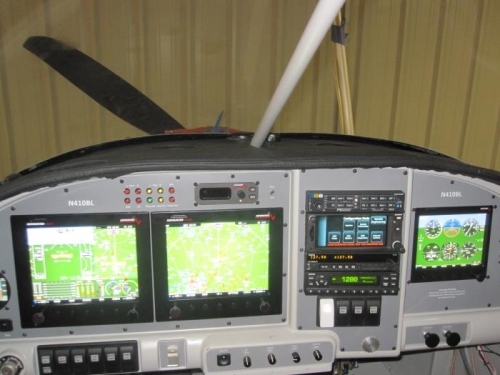 The hardest thing for me was putting together the wiring diagram for how the center stack was connected (Audio Panel, Garmin 430, 2nd comm + transponder). Once I had the diagram made, it took me about 4-6 hours to get it all wired up. Definitely not that difficult. There is some extra investment needed in some extra crimpers if you're putting in a Garmin GNS650 or anything else using micro pins. Wiring was one of the more favorite parts of the build for me. With that being said, I do have an Electrical Engineering background, so wiring is no stranger to me. The only regret I have is I should of put in some service looks when I wired up everything. As I have swapped out a few items since the airplane was originally flown, I have found the need for an extra inch or two of wire on some of my upgrades (ex Garmin 430 to 650). If you end up rolling the wiring harness yourself, please post any questions you have. Lots of us have rolled our own harnesses and we can get you through it. Save them dollars for airplane gas! I can't stress enough what Mike mentioned about service loops. I thought I put adequate service loops in place when I wired my panel. I did it on the dining room table. I thought a few inches in front of the panel would be adequate. It should have be at least a foot. I have a RV-10, so YMMV on a two seater panel. I also swapped out all the little slotted DB set screws with thumb screws from SteinAir. It makes removing the DB connectors much simpler. The photo looks a little messy, but those are the pigtails that go to other places on the aircraft. A lot of has been moving forward on the project. My engine arrives Monday, and I've moved forward on the panel. Still much to do on the fuse though. Stein is cutting, hydro dipping and etching the panel and will make the interconnect diagrams for my panel. 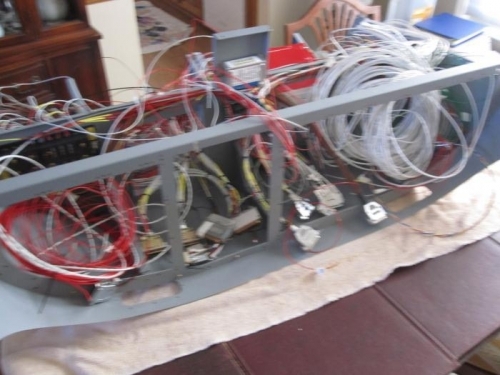 I will wire it up myself on the bench prior to installation in the plane. I have a slider. Any input on how to work out sub panel access? Anything you guys wish you did differently? I love seeing all of the posts on your panels- it is a bit intimidating. Did you all order different colors of wire? I was considering mostly white and using a label maker to mark all of the ends. How much should I buy? All of our aircraft are similar,meow much and where did you purchase? If I can figure out how to post pics, I will. Joe, I found a coil of 22awg tefzel on ebay that proved to be indispensable. I made small harnesses for my switches and fed all kinds of control circuits with it. As far as other stuff... Yes all white is fine with the proper labels. You Need to get a fair amount of 18 awg for limited power stuff under 10 amps and the rest is really dependent upon your specific needs. Huge help. Thanks. It's a bit overwhelming. I'm going through each of the components and following their recommendations. I just made a four way splice under the seat pan for the nav lights. However... Recently I helped a friend troubleshoot a short in that very circuit and because he ran them all back to the switch, he was able to disco the shorted tail and still use his navs.